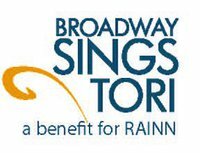 Monday, June 27th a star-studded Broadway cast will be performing the music of Tori Amos in "Broadway Sings Tori: A Benefit for RAINN" at the New World Stages. The event, which will be donating all proceeds to RAINN, promises to be an uplifting evening! Tickets are $35-$125, with a two hour open bar included with all tickets $75+.Buy your tickets today or call 212-239-6200 for additional ticket information.